Worldwide distribution: Widely distributed in the Northern Hemisphere. Local distribution: Common and widespread in Britain and Ireland. Habitat: Dead wood near streams and deciduous woodland. Foraging season: Early winter to early spring. These little gems appear in the depths of winter, when not too many things are growing in the wild. The fruiting bodies display a flash of bright colour amidst the boring monochrome landscape characteristic of the season. 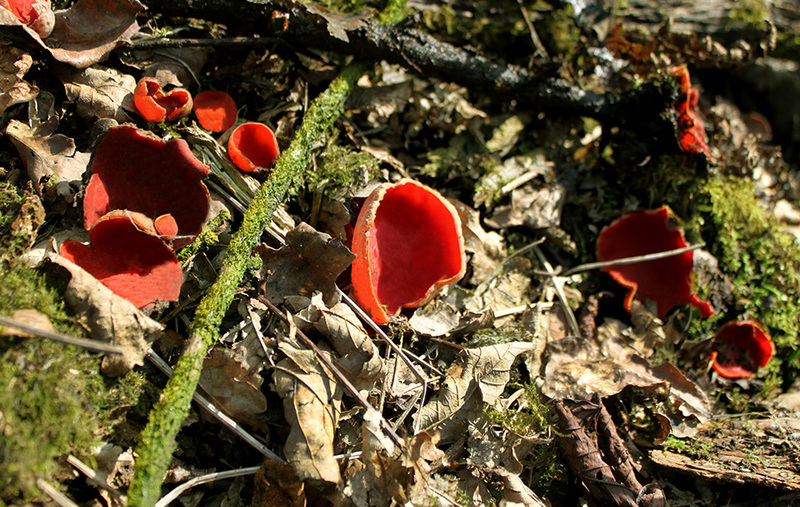 Scarlet elf cup (Sarcoscypha coccinea) is virtually indistinguishable from the similar ruby elf cup (Sarcoscypha austriaca) without microscopy. Both of them are generally reckoned to be edible and their vivid red colour serves to distinguish them from anything else. 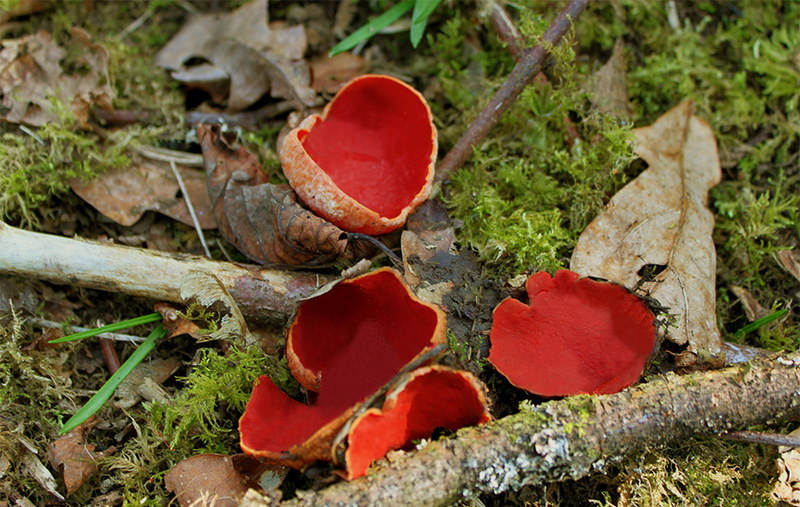 Indeed, the edibility of scarlet elf cups is disputed. Some sources still list the fungi as inedible, perhaps because the texture is quite different to what you’d normally expect from a mushroom. 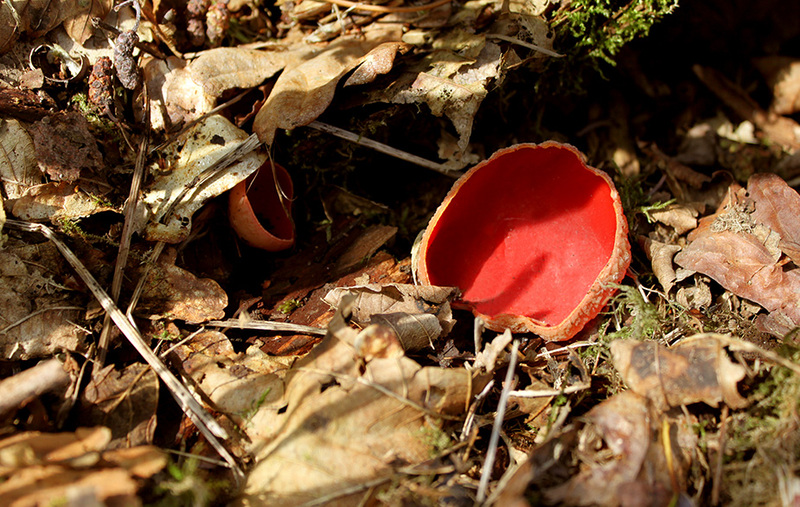 Nonetheless, scarlet elf cup has been eaten for years with no bad reports. Scarlet elf cups have a subtle earthy flavour with a slightly woody texture. They can be stir fried and sprinkled in salads for colour. The fruiting bodies seem to be designed to use them like little baskets. Fill them with any other seasonal ingredients to make raw wild canapés, like three cornered leek, garlic-mustard, wild garlic or wood sorrel.